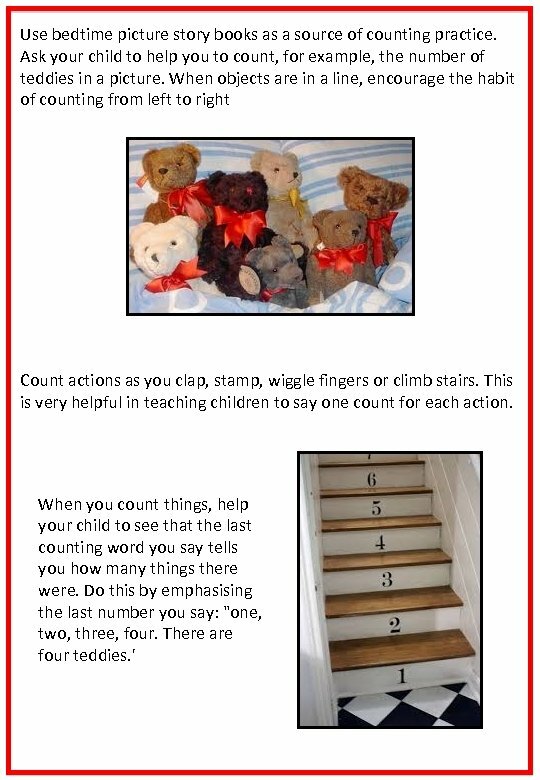 More Counting Help your child to count beyond 20 by counting steps as you walk to school. Try starting at a multiple of 10 (10, 20, 30, 40 etc. ) and help your child to count on. 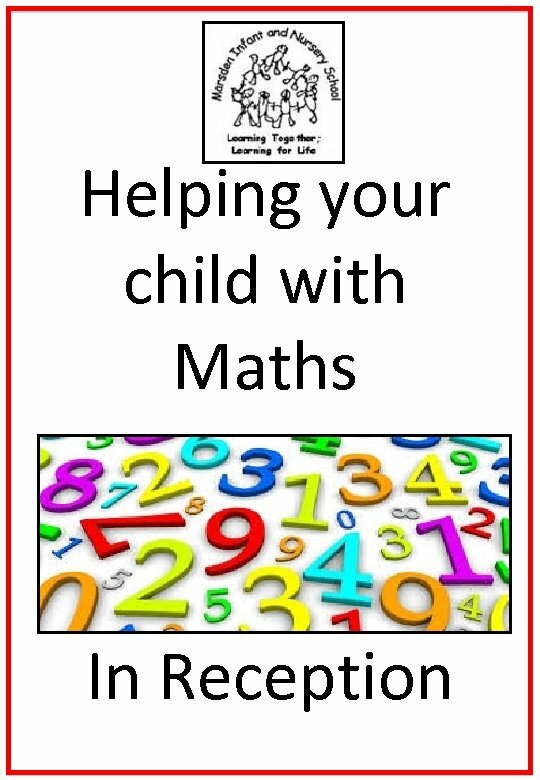 Number Recognition Help your child to learn to recognise numbers. Point out numbers you see in everyday activities, such as numbers on packets or prices, car number plates, house or bus numbers. 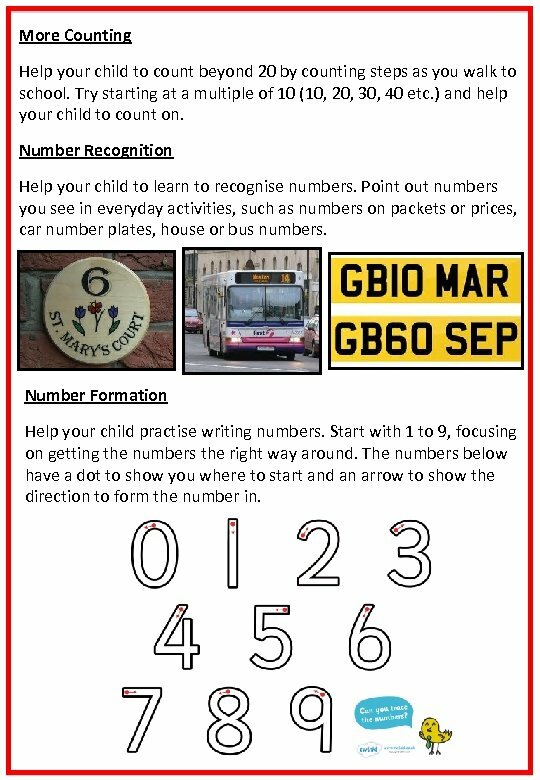 Number Formation Help your child practise writing numbers. Start with 1 to 9, focusing on getting the numbers the right way around. The numbers below have a dot to show you where to start and an arrow to show the direction to form the number in. Addition Give your child 2 groups of objects. Ask them how many altogether. Encourage your child to put the 2 groups together and count them. When your child is confident at combining 2 groups of objects, move on to dice. Roll 2 dice. Help them add the two numbers together. 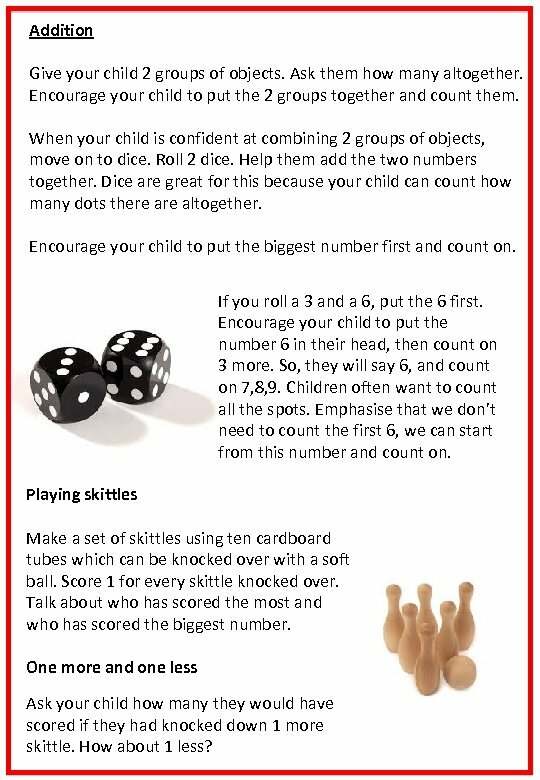 Dice are great for this because your child can count how many dots there altogether. Encourage your child to put the biggest number first and count on. If you roll a 3 and a 6, put the 6 first. Encourage your child to put the number 6 in their head, then count on 3 more. So, they will say 6, and count on 7, 8, 9. Children often want to count all the spots. Emphasise that we don’t need to count the first 6, we can start from this number and count on. Playing skittles Make a set of skittles using ten cardboard tubes which can be knocked over with a soft ball. Score 1 for every skittle knocked over. Talk about who has scored the most and who has scored the biggest number. One more and one less Ask your child how many they would have scored if they had knocked down 1 more skittle. How about 1 less? 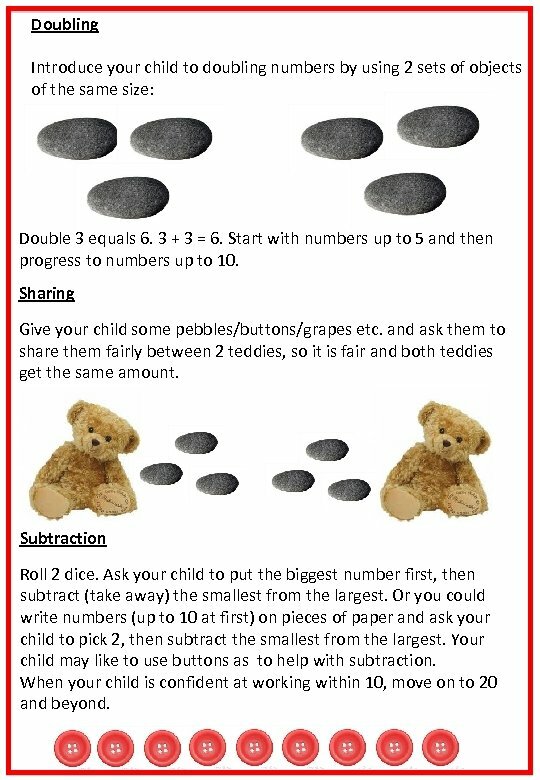 Doubling Introduce your child to doubling numbers by using 2 sets of objects of the same size: Double 3 equals 6. 3 + 3 = 6. 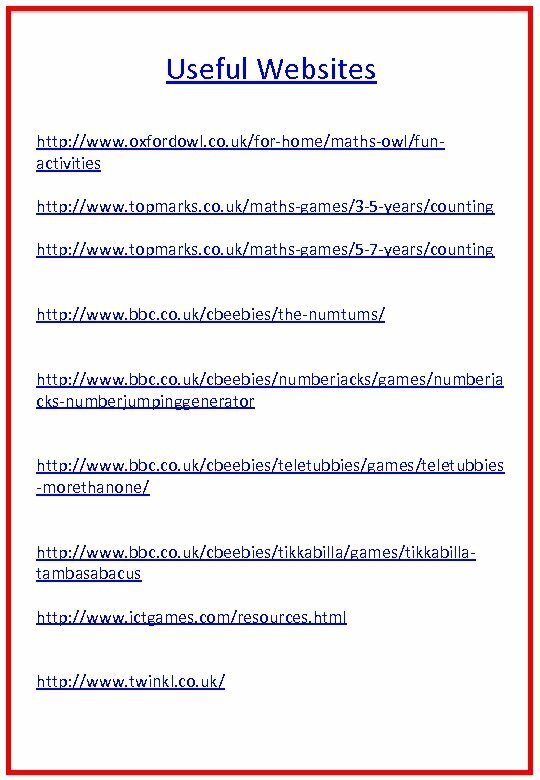 Start with numbers up to 5 and then progress to numbers up to 10. Sharing Give your child some pebbles/buttons/grapes etc. and ask them to share them fairly between 2 teddies, so it is fair and both teddies get the same amount. Subtraction Roll 2 dice. Ask your child to put the biggest number first, then subtract (take away) the smallest from the largest. 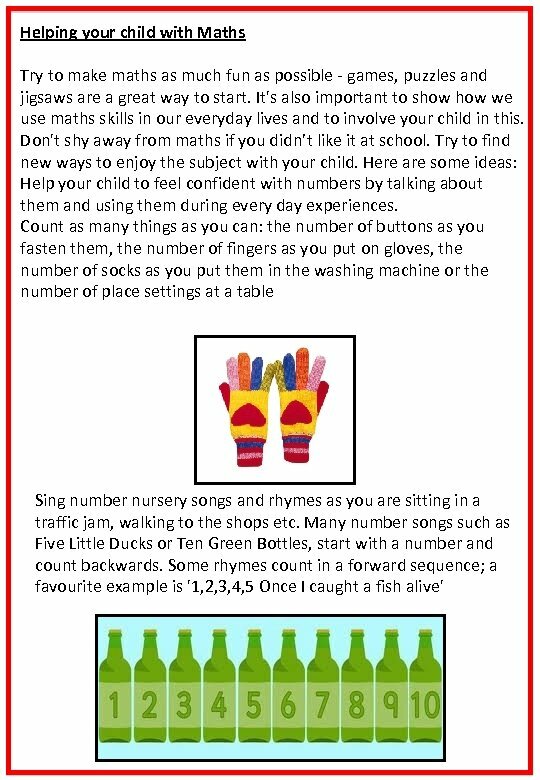 Or you could write numbers (up to 10 at first) on pieces of paper and ask your child to pick 2, then subtract the smallest from the largest. Your child may like to use buttons as to help with subtraction. When your child is confident at working within 10, move on to 20 and beyond. Repeating Patterns Help your child to recognise and continue repeating patterns. To do this, you could use buttons or simply draw coloured spots on a piece of paper. 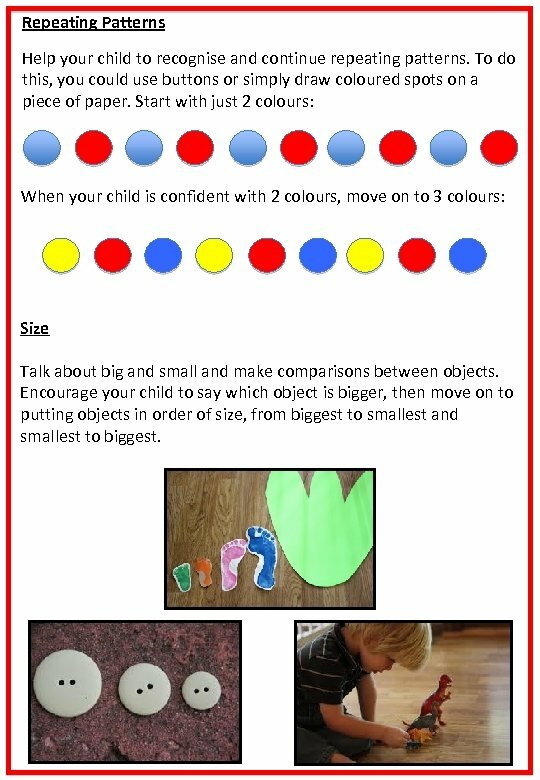 Start with just 2 colours: When your child is confident with 2 colours, move on to 3 colours: Size Talk about big and small and make comparisons between objects. 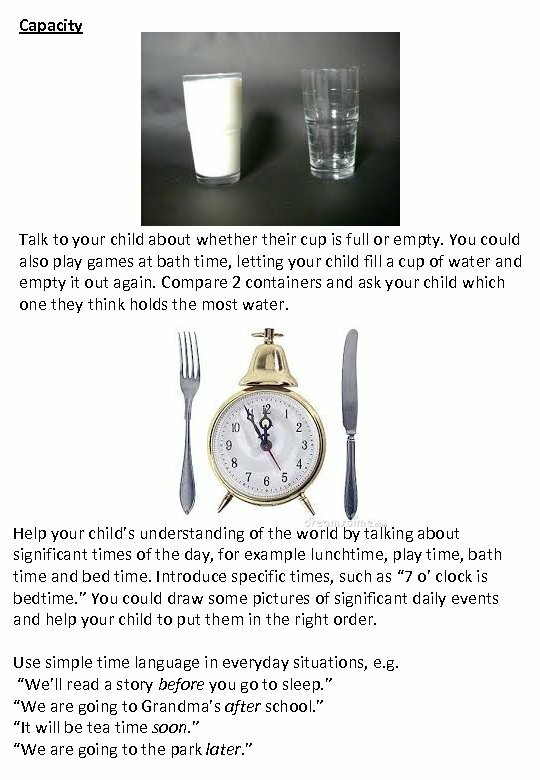 Encourage your child to say which object is bigger, then move on to putting objects in order of size, from biggest to smallest and smallest to biggest. Money When you go shopping there are many opportunities for helping your child with maths. Let them handle money and help them to recognise the coins. 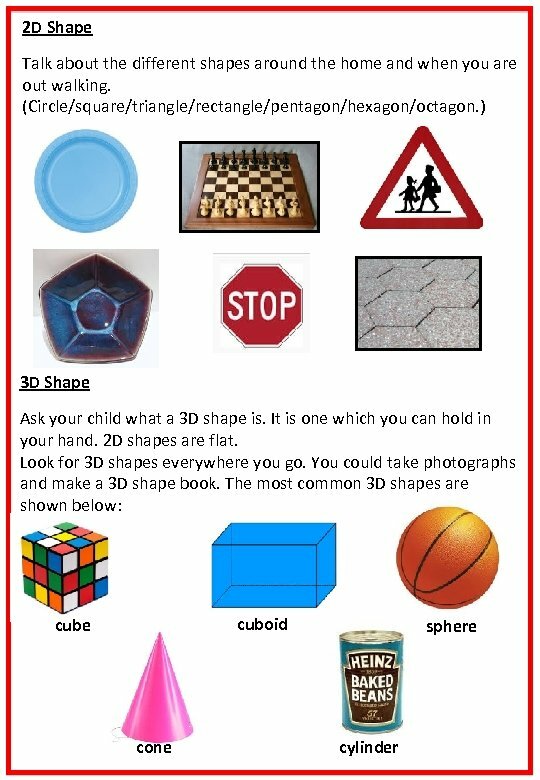 Ask your child to give you 3 p. Ask your child if that is the only way to make 3 p. What other ways are there? 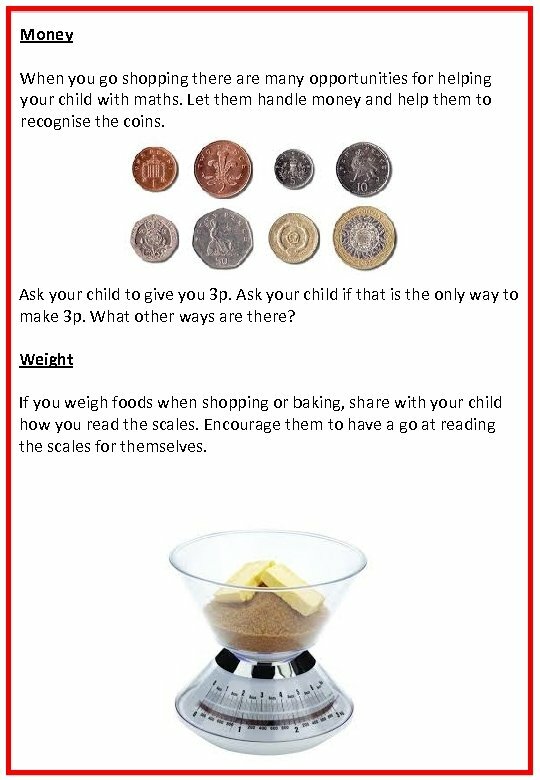 Weight If you weigh foods when shopping or baking, share with your child how you read the scales. Encourage them to have a go at reading the scales for themselves.